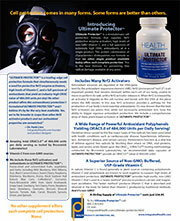 Health Products Distributors, Inc. recently released its new Ultimate Protector™ formula. Ultimate Protector is a next generation cell protection formula that simultaneously meets the needs for high levels of Vitamin C, full spectrum antioxidants (high ORAC values), and protective enzyme activators (Nrf2 activators) in a single product. This potent combination of characteristics distinguishes the formula because no other single product available today offers such complete protection. This formula represents a quantum leap forward in providing total antioxidant protection from all types of free-radicals! • ANTI-AGING. Ultimate Protector helps resist the aging process with extraordinarily potent free-radical defense. Consequently, you can feel younger, live longer, and be stronger. • ANTI-INFLAMMATORY. Fight inflammatory responses throughout your body! Reduce the inflammatory cascades leading to degenerative conditions and premature aging. • PAIN RELIEF. Free-radical damage can cause pain. Stop unnecesary oxidation rapidly by massively increasing your antioxidant potential with the most potent cell protection formula available (486,000 units!! – as measured by Brunswick Lab’s ORAC5.0™ test). This formula fights all five major types of free radicals making It the most complete protection you’ll ever find! • CARDIOVASCULAR SUPPORT. Vitamin C and other antioxidants help create optimal health for the entire cardiovascular system. Reduced oxidation in vessels and the heart allow and support for cell structures provides for greater cardiovascular health and prevents premature aging of the circulatory system. • FIGHTS HYPERTENSION. Provides plant-based nutrients known to mitigate high blood pressure. • BOOSTS IMMUNITY. Supports immune system health by providing nutrients that allow optimal oxidative defenses throughout the body. • REDUCES JOINT STIFFNESS. Supports joint health, flexibility, and normal range of motion. This benefit relates to the powerful anti-inflammatory effects Ultimate Protector provides. • FIGHTS EFFECTS OF RADIATION. Mitigates, prevents, and reverses genetic damage due to radiation exposure. Uniquely powerful capacity quench free radicals allows your body to heal adverse effects relating to harmful exposures (past and present). • FACILITATES INTERNAL PRODUCTION OF ANTIOXIDANT ENZYMES BY SUPPLYING NRF2 TRANSCRIPTION FACTOR ACTIVATORS. • ACTS FAST! Acts rapidly to quench free radicals. Effects may be noticeable within hours. In order to get an initial idea of what some of the actual benefits users of Ultimate Protector are experiencing we have had a group of eight people take Ultimate Protector for a period of about two months. Then we asked them to tell us how they have benefited as a result. The results of this informal, anecdotal study are provided below. In reviewing the experience of each person in the group, the following patterns emerged: 1) Most people have a clearer mind including better concentration, alertness, and greater focus, 2) Most people have experienced greater energy, endurance, and require less sleep, 3) Many have experienced greater resistance to colds, flu, and other illness, 4) Many reported reduced back and joint pains, as well as reduced inflammation, 5) Several people reported reduced allergies and improved breathing, and 6) One person experienced improved fine motor control and better balance. Interestingly, when asked where in their supplement regimen they would rank this new formula, most participants said it was either first or second, and virtually everyone ranked it in their top three supplements. This is impressive for a new supplement entering into the regimens of people who already take a substantial number of supplements daily. 1) JJ – Here are some things I’ve noticed since taking Ultimate Protector for the last two months. • My mind seems clearer. • I have greater attention span. • I feel more confident in every thing I do. • I don’t tire as easy. • I have more energy. • I am less hungry. • I am more emotional. • I am breathing better. 2) JB – Benefits I have experienced after taking six to eight Ultimate Protector caps for the last two months. • I need less sleep….noticeably. • It helped me avoid a flu/cold and turned it into a two-day event rather than a two week event like most folks who have had the current strain. • Ultimate Protector has made me feel more resilient to pain…like it’s moved me up a notch in health. • The inflammation in old, injured areas of my ankles and knees seems to be less likely to flare up from heavy uses and when it might, it goes away quicker. • Overall it seems to enhance my general health up a notch and specifically my immune health up several notches. I have noticed that I am happier emotionally. • I’m sleeping better. I’ve seen the symptoms of RLS (restless leg syndrome) become nonexistent since taking UP. I’m getting a deep, restful night’s sleep. • I don’t have much muscle stiffness or leg cramps. Especially in the morning I’ve been used to stretching out my legs. UP seems to have drastically mitigated these symptoms. • I’m not getting tired in the afternoon and my workday feels more creative and alert. Overall, my mind feels very clear!! • I feel “brighter” when I get up in the morning. • I get ‘cold sores’ on my lip about twice a year, usually when weather changes abruptly. This last bout, the sore lasted fewer days and was smaller and less painful. The change was quite noticeable. • I feel more alert later into the afternoon and early evening than previously. • I have been getting better at focusing on a task to completion rather than flitting around between tasks. 5) RB – Here are some of the things I have noticed since taking three caps in the morning and three in the evening of Ultimate Protector for the past two months. • Greater relief from allergies (this so far is the best thing for me). • I am feeling more rested in the morning. • I am able to breathe better. • I have greater energy. • I require less sleep, and am more energized in the morning. • I perform better even when I get less sleep than normal. • I have greater capacity for mental concentration and focus. • I feel rejuvenated and more youthful. • It has helped me ward off colds and flu. • I need to take fewer antioxidant supplements, i.e., I need less vitamin C.
• I feel “in the zone” more often. 7) MH – Since I started taking Ultimate Protector, I have noticed significantly less pain and inflammation in my body!! I am amazed and feel so much better!! 8) HL – I have been taking Ultimate Protector for the past two months at the level of 12 caps daily. Here is what I have noticed. • I have noticed a reduction in joint pain. • My mind is clearer. • I have noticed better physical balance and improved fine motor control. • It has helped me prevent colds and flu. The HPDI Rejuvenation Program provides practices, protocols, and recommendations proven over 26 years. It is a complete program to rejuvenate, regenerate, and boost vitality to body, mind, and spirit. It is especially helpful for those who want to restore health. In Part Four of the Rejuvenation Program series, I presented key roles played by four foundational nutritional supplements, which I also refer to as “foundational” (or sometimes “core”) supplements. These nutritional supplements are critical to success in creating powerful health by establishing optimal nutrient status in the body. We regard foundational supplements to include 1) Multivitamins, 2) Antioxidants / Vitamin C formulas, 3) Essential Fats, and 4) Rejuvenate!™ High-RNA superfoods (and/or other sources of dietary nucleic acids). The four types foundational supplements are the most important supplements regardless of what other supplements you take. We particularly recommend our HPDI supplement formulas, primarily because they incorporate the latest science, and provide the highest-purity and highest-quality nutrition, cutting-edge design, and uniquely effective ingredients (e.g., coenzyme form B vitamins). Perhaps most importantly, they are designed to work together synergistically as part of our system of foundational nutrition. Our multivitamin formulas include Multi Two (tabs and capsules) Hank & Brians’ Mighty Multi-Vite!™, and the Mini Multi (contains no fillers, excipients, or additives). Our essential fats formulas include Omega Plus and Hank & Brian’s Essential Fats Plus E. Our Antioxidant / Vitamin C formulas include Ultimate Protector™, PRO-C™, OPC-C™, Buffered Vitamin C 1,000 (tabs) and Buffered C (powder). Among the topics treated in Part Three of the Rejuvenation Program series, I discussed foods recommended in the HPDI Rejuvenation Program. Recommendations include consuming foods high in nucleic acids (RNA and DNA). High-RNA foods include many beans and legumes, vegetable soups (and broths), many fish (e.g., sardines) and seafoods, and high-purine vegetables like onions and spinach. These are wonderful foods for health. However, richer sources of nucleic acids include chlorella (ten times more RNA than sardines) and Rejuvenate!™ superfoods. Rejuvenate!™ superfoods provide high levels of RNA not only because all of them (except Rejuvenate!™ Berries & Herbs and Rejuvenate! Strawberry-Peach Protein Plus) contain chlorella, but also because they include other high-RNA foods such as nutritional yeast, RNA extracts (from yeast), and chlorella growth factor (CGF) (an RNA-rich extract of chlorella). This allows for a broader spectrum of nucleic acids and for higher overall levels of nucleic acids per serving. While Rejuvenate!™ superfoods provide high levels of nucleic acids (for rejuvenation, revitalization, and superior health), they also include supporting nutrients (e.g., d-ribose, coenzyme B vitamins) that facilitate efficient uptake and utilization of nucleic acids in the body, and thereby help to optimize their healing effects. In fact, HPDI designs Rejuvenate!™ superfoods to include specific ingredients that leverage therapeutic benefits of nucleic acids and provide superior overall nutrition. For example, d-ribose (as mentioned above) is a rate-limiting nutrient for the uptake of nucleic acids. D-ribose is the molecular backbone of nucleic acids, and it is therefore needed in the body to utilize them. In short, the body uses nucleic acids most effectively when optimal amounts of d-ribose are readily available. B-vitamins are known to significantly enhance the effects of nucleic acids. Rejuvenate!™ superfoods provide coenzyme forms of B vitamins, which are the natural forms most easily recognized (and used) in the body. The pioneering nucleic acid researcher Dr. Benjamin Frank showed that B vitamins increase certain beneficial effects of RNA during nucleic acid therapy with dietary nucleic acids. Because the body utilizes coenzyme form B vitamins most efficiently, the benefits of nucleic acids relating to B vitamin intake can be realized more rapidly. While therapeutic levels of nucleic acids are desirable in themselves, the fact that Rejuvenate!™ superfoods provide valuable supporting nutrients means that the body will be better equipped to assimilate and use nucleic acids to support processes of rejuvenation. This can significantly improve health, naturally. HPDI offers five versions of Rejuvenate!™, including Rejuvenate!™ (original greens), Rejuvenate!™ PRO, Rejuvenate!™ PLUS, and Rejuvenate!™ Berries & Herbs and Rejuvenate! Strawberry-Peach Protein Plus. Rejuvenate!™ PLUS and Rejuvenate!™ Berries & Herbs are the most comprehensive formulas our line. Both provide delicious taste, therapeutic levels of dietary RNA, nutrients that support the body’s use of nucleic acids (e.g., d-Ribose), a complete multivitamin, essential fats, fiber, and high levels of protein. In Part Five in the Rejuvenation Program series, I presented what we consider the seven most important supplements for rejuvenation beyond foundational supplements. These include Coenzyme Q10 and Ubiquinol, Magnesium (including magnesium chloride and Myo-Mag), Hepa Plus, Nascent Iodine, the immune-supporting herb Echinacea, and Immune-Assist™ mushroom-polysaccharide complex. Each of these supplements plays a major role in our Rejuvenation Program. In this month’s article, I discuss three supporting protocols, including the Garlic Program, Hydrotherapy Program, and Sauna Program. These are major supporting protocols in the Rejuvenation Program, which is our complete program for creating vitality and health. There are additional supporting protocols, which I will consider in forthcoming articles. Garlic is one of the most effective and versatile therapeutic plants in the world. Indeed, it not only is a food, but also a proven medicinal herb, and supports powerful health via many modes of action. It has a long history of health-enhancing and culinary uses, making it an ideal example of a food that can be used for therapeutic purposes. We include the use of garlic as its own supporting protocol because of its effectiveness in providing the body with a highly diverse range of benefits. For example, it acts as a powerful broad-spectrum antibiotic. It also exhibits antiviral, antifungal, and antiparasitic properties. In this regard, it has been proven to rid the body internally and externally of nearly any antigen or pathogen. Garlic also is a superb source of the mineral sulfur. In addition, garlic is a rich source of organic selenium. Selenium is an important antioxidant and key component of the enzyme glutathione peroxidase. There have been over one thousand research studies on garlic during the last 40 years . These studies have investigated the following effects of garlic: 1) antibiotic effects, 2) cardiovascular effects (including cholesterol lowering), 3) anticancer effects, 4) effects on blood sugar, 5) effectiveness as a heavy metal antidote/chelator, 6) potential alleviation of intestinal problems, and 7) other biological and chemical effects. Research studies show that garlic lowers serum cholesterol and triglycerides while raising HDL cholesterol (i.e., the “good” cholesterol). It reduces the “stickiness” of platelets, making blood circulation more efficient. In addition, it causes a mild reduction in blood pressure. This makes garlic an ideal component or adjunct in programs/regimens for heart health, cholesterol reduction, circulation (throughout the body), and blood pressure reduction. As noted, garlic exhibits potent antibacterial, antiviral, antifungal, antiparasitic effects, and exerts action against organisms causing yeast infection. In this regard, it provides excellent support in programs/regiments that involve infections and for building immunity. In addition, when regularly consumed, garlic is associated with lowered risk of stomach and colon cancer. In fact, garlic has been proven in hospitals and laboratories worldwide to destroy cancer and break up tumors. Garlic can be used externally an “herbal surgeon” (so use care when using it externally). Considering all the beneficial effects of garlic from thinning blood to normalizing blood pressure and cholesterol levels, it becomes apparent that garlic benefits the entire body. Rather than targeting a single organ or health condition, it works systemically to improve the overall health. Garlic is therefore ideal both for improving specific conditions (i.e., the health of the heart and circulatory system) and helping to create and maintain excellent health. This partly relates to the fact that it acts a powerful preventive to counteract health concerns (e.g., elevated cholesterol) before they lead to major conditions (like heart disease). Consume three (or more) large cloves of fresh, organic, raw garlic every day. Garlic can be eaten raw, swallowed whole, chopped up and mixed with food, or juiced with other vegetables. The best garlic is the hottest, and, of course, organic. Raw garlic is the most therapeutic, but cooked garlic will still provide certain benefits. Garlic supplements can be used whenever fresh garlic is not available or desirable, or as adjuncts to fresh garlic. Enterically coated garlic supplements provide the highest potency and the greatest total allicin potential. Allicin is the component of garlic responsible for most of its health benefits. Allicin is formed when the garlic enzyme alliinase comes into contact with alliin (the principal active phytochemical/component in garlic). This occurs when garlic is chopped or crushed, as occurs when chewing. The more garlic is crushed, chopped, or chewed before it’s eaten, the greater the amount of allicin is formed. In addition to chewing it well, this means it may be beneficial to use a garlic press, food processor, or other kitchen gadget to crush, mince, or finely chop the garlic before you eat it. If (or when) you cannot consume fresh, raw garlic, then supplements can ensure you get your daily dose. In this regard, it is important to note that stomach acids destroy alliinase. This means that garlic powders (in capsules) subjected to stomach acid are ineffective. Enteric coatings that break down in the small intestine at higher pH (but not under the acidic conditions of the stomach) are required to gain maximum benefit from a garlic supplement. If you decide to take supplements, then look for a high-quality, enteric coated garlic supplement. There are several very potent products that are convenient, easy to use, and odorless. For example, try to find a 500 mg tablet providing 6,000 mcg (minimum total allicin potential) equivalent to 1,500 mg of fresh garlic. Garlic, of course, has a long history of therapeutic use and has been studied extensively for decades. Yet modern research continues to discover additional benefits of garlic and reveals the mechanisms behind its therapeutic effects. For example, it was widely known that garlic provides powerful antioxidant protection. But the mechanism of its antioxidant activity was only recently shown to relate to sulfenic acids that form when allicin breaks down within the body . Sulfenic acid acts far more powerfully and rapidly to quench free radicals than any known antioxidant. As allicin breaks down into its components, the sulfenic acids that form can immediately react with free radicals to neutralize them. The speed of this reaction is limited only by the rate at which the molecules come into contact. No other antioxidant substance reacts as rapidly as sulfenic acid from garlic. What also surprised researchers is that garlic exhibits high antioxidant activity, but does not contain substances associated with high antioxidant activity, including proanthocyanidins (from grapes), catechins (from green tea), or other bioflavonoids. It is clear is that sulfenic acids in garlic largely account for its powerful antioxidant properties. In fact, sulfenic acids may be the most potent biological agents in terms of their capacity to prevent oxidation. Another recent study indicates that sulfenic acids are not the only substances in garlic that acts as antioxidants. It was demonstrated that garlic significantly increases the activity of various important antioxidant enzymes, including superoxide dismutase . Garlic also lowers blood levels of malondialdehyde (MDA), a key biomarker for lipid peroxidation. MDA levels provide a measurement of the levels of oxidation of fats in the body. The capacity for antioxidants in garlic to reduce lipid peroxidation indicates that garlic offers surprisingly powerful antioxidant protections that make it one of the healthiest foods available. One of the greatest advantages of garlic is that its therapeutic benefits can be enjoyed alongside its delicious flavor than adds character to many different foods (especially if you like garlic). Individuals who do not enjoy the taste of garlic (or who wish to avoid any hint of “garlic breath”) can try a potent, enteric coated garlic supplement, such as One-A-Day Garlic Tabs. Hot and cold showers are a very effective way to move the blood and create circulation. Once daily, take a complete hot and cold shower. You will start with hot water for 1 minute, then cold for one minute. Repeat this seven (7) times so the shower should last about fifteen minutes. If starting out with hot water is too intense for you, then start with warm water. Likewise, if your cold water is extremely cold, then start with slightly cool water. As your body adapts, you can adjust the water temperature both to make it hotter and/or colder. Ultimately, using water temperatures as extreme as you can tolerate will produce stronger therapeutic effects. On a different occasion daily, you can re-take a complete hot and cold shower again, or do a partial one just applying the water directly an affected area where there is pain or dis-ease. While alternating hot and cold water during the shower, pay special attention to any affected area and massage it vigorously. If no shower is available to you, then alternate hot packs (e.g., a hot water bottle) and ice packs. Alternating hot and cold showers effectively stimulates circulation and improves heath and healing. This is because alternating hot and cold temperatures to the body acts like a pump to drive circulation. It works like this. Hot water visibly brings blood flow to the surface of the skin. Cold water drives blood deep into the body (resulting in a pale complexion). Applying hot water again brings the blood to the surface, and then cold water drives it deep into tissues. After alternating hot and cold water seven times (for a total of seven complete “cycles”), your circulation will really be moving. This supercharges your circulation. The key reason that improved circulation helps heal and regenerate the body is because an injured, weakened, or even sedentary body often lacks circulation in some or many areas. Increased circulation restores normal function. In addition, reduced circulation brings less oxygen and fewer nutrients to cells, and reduces the ability of the body to remove cellular wastes and detoxify. An equally important reason improved circulation is critical for rejuvenation because improved circulation overcomes blockages. For example, an injured or dis-eased area may experience reduced circulation due to blockages of blood flow relating to many causes. For example, these causes may include damaged tissues, impaired vessels or capillary trauma, scarring, abnormal cell growth, clots, conditions that reduce and/or weaken blood cells, liver disease, anemia, and others. Stimulating circulation with external means (i.e., alternating hot and cold water) helps the body overcome blockages and significantly increases blood flow. Because blockages reduce blood flow and contribute to dis-ease, the action of increasing circulation simultaneously acts to reduce or eliminate blockage, improve flow, and helps the body to heal, regenerate, and create powerful health. The hydrotherapy program works well with other supporting protocols, especially the magnesium chloride baths that are part of the Magnesium Chloride program. Sauna therapy is a safe, effective, and enjoyable modality that detoxifies and heals the body. Saunas have been widely by many civilizations and cultures, including the US in the 19th century. Sauna use reemerged in the US in the late 20th century as a means for removal of toxins from the body. The popularity of saunas increased after the introduction of infrared saunas, which are more enjoyable for many individuals, and are more effective for detoxification. We highly recommend using saunas, especially far infrared saunas, for their powerful health benefits . There are many brands of far infrared saunas available. We prefer the upright type that is usually constructed of wood. Saunas are powerful for detoxification because they help eliminate organic chemicals, excess metals and minerals, biological toxins, and other sources of toxicity. A full exploration of how saunas detoxify and build health is beyond the scope of this article. However, I will address the unique capacities for detoxification facilitated by far infrared sauna therapy. The far infrared (FIR) sauna is a very useful detoxification tool. Far infrared saunas provide all the benefits of conventional saunas, but add additional benefits, including deep tissue healing and enhancing the activity of water molecules in the body. In a far infrared sauna, the radiation heats our bodies from the inside out (much as the sun does to our skin on a sunny day). The thermal effects within the deeper layers of tissue cause the blood vessels and capillaries to dilate, promoting increased circulation and removing metabolic wastes and toxins through sweating. Infrared light also activates water molecules in the body by vibrating them at infrared frequencies. Vibrating water molecules become more active as they are ionized into hydrogen and hydroxide ions that release gases and other toxic materials. This is one means by which infrared light decouples toxins from water molecules in the body, and liberates them for elimination through skin. The act of decoupling toxins from water molecules also reduces the surface tension of the body’s water to support hydration and tissue oxygenation. An additional response to infrared light is that cell mitochondria also increase energy (ATP) production, thereby raising the metabolic rate. Infrared activation of water molecules in the body provides major benefits through multiple modes of action: facilitating cellular processes, increasing metabolism and energy, and liberation of toxins so they can be removed via the skin. These benefits exert reciprocal effects to allow the body’s detoxification processes to become increasingly effective. For example, decoupling of toxins makes them available for removal; greater energy allows cells to process toxins more effectively; improved metabolism allows for faster excretion of toxins through skin. These synergistic effects mean that a far infrared sauna can induce far greater rates of detoxification than conventional saunas. Far infrared saunas also demonstrate significantly increased detoxifying effects because the heat they generate can penetrate deeper tissues. A key benefit: when using a conventional sauna, it is estimated that sweat contains about 2% toxins and 98% water. In a far infrared sauna, the ratio increases significantly to 20% toxins and 80% water. We recommend setting the sauna air temperature to about 125–135 degrees Fahrenheit and remain in the sauna between 20–35 minutes. Do this several times per week (or every day for three weeks for more intensive detoxification). As your body adapts to sauna therapy, you can gradually increase time spent in the sauna. However, always be aware of your limits, and do not push yourself beyond the point you can tolerate safely. Adjusting to higher temperatures and longer durations takes time. Saunas improve the health of the body via multiple modes of action. These modes include: increased circulation, greater tissue oxygenation, improved delivery of nutrients to cells, deep muscle relaxation, and other benefits. However, one of the primary benefits of sauna therapy relates to detoxification of organic chemicals, excess metals and minerals, and biological toxins. I discussed detoxification as a foundational element of rejuvenation in Part Two of the Rejuvenation Program series. Effective methods for removing toxins can be found in our Rejuvenation Program. These methods include protocols for detoxification, for example, a juicing program combined with certain herbs and supplements, including Rejuvenate!™ superfoods, Intestinal Rejuvenation Formula, Edible Earth, Nascent Iodine, and Hepa Plus (a liver-specfic herbal supplement). My treatment of sauna therapy is no less relevant than other methods or modalities for detoxifying. Indeed, we include far infrared sauna therapy as one of the supporting protocols in our Rejuvenation Program precisely because of its effectiveness and ease of use. Skin is an amazing organ both for taking in nutrients (e.g., sunshine, air, transdermally applied magnesium chloride) and for eliminating toxins. As noted, sauna therapy leverages our capacity for eliminating toxins through skin to increase rates of removal. It is the modality of choice for removing certain toxins. When combined with other modalities (e.g., juicing and consuming therapeutic clays like Edible Earth), the rate of detoxification substantially increases. Sauna therapy detoxifies from the body at least three major categories of toxins: 1) organic chemicals, 2) toxic or excess metals and minerals, and 3) biological toxins. Tens of thousands of toxic chemicals exist in our environment. They make their way into our bodies, burden detoxification organs, impair cellular function, and damage health. Most of these chemicals are not tested for safety. They range from industrial and household chemicals (including petrochemicals) to various solvents, additives, preservatives, pesticides, herbicides, fluoride, chlorine, chemicals in fire retardants, and in metabolized wastes of pharmaceutical drugs found in the water supply, just to name a few. Some of the more common toxic chemicals include PCBs, trichloroethylene and volatile organic compounds (VOCs), formaldehyde, pthalates, and phenols (including bisphenol A). In addition, many of these toxic chemicals are endocrine (hormone) disruptors (xenoestrogens). While most of toxic chemicals have not been tested for safety, it is often possible to test an individual for specific chemicals. However, testing is expensive, and testing for thousands of chemicals is impractical, even when tests exist. However, it is known that when tests are conducted, subjects typically show positive for about half of the chemicals in a given test. Yet, when testing indicates the presence of toxic chemicals in the body, the current medical system offers few options for detoxification. In this regard, sauna therapy is probably one the most effective modalities for helping to remove existing toxins. Toxic metals and minerals/elements present another set of toxins that require detoxification. Like toxic chemicals, toxic metals are ubiquitous in the environment, persistent and highly damaging to biological systems, and often difficult to remove from the body. Toxic metals include lead, mercury, cadmium, aluminum, and arsenic. Other metals can become toxic depending on their form or deficiencies in other metals. These metals include iron, copper, manganese, and selenium. Common toxic minerals/elements include chlorine and fluoride, but can include excessive amounts of minerals required for good health. Symptoms and conditions associated with metal and/or mineral toxicity are many and varied. These include weakened immunity, mental impairment, cognitive dysfunction/learning disabilities, hypothyroidism, diabetes, joint pain, cancer, and various behavioral and emotional problems. Far infrared saunas are particularly well suited for removing toxic metals and excess amounts of vital minerals. Other toxins that can be cleared by sauna therapy include biological toxins. Biological toxins are often related to chronic infections, including powerful toxins released by bacteria and fungi. It is interesting that bodies weakened by exposure to toxic chemicals or metals are predisposed to chronic infection. Removal of toxic chemicals and metals through far infrared saunas will improve individuals’ capacity to fight infection. In addition, saunas address infection-related biological toxins directly by increasing circulation, heating the body, and employing other means that can reduce or eliminate chronic infections. In general, saunas exhibit two phases in which distinct physiological effects occur. Distinguishing the two phases is important because it is necessary to experience both phases for maximum health benefits. Whereas the first phase typically lasts for 10–30 minutes, inception of the second phase depends on various factors. These factors include how frequently an individual uses a sauna because as the body adapts, phase one time may decrease to ten minutes. In the first phase, body temperature remains at about basal level and sweating is not profuse. The temperature of the body does not increase greatly because heat is dissipated by increased circulation, shunting of blood to surface tissues, and sweating. However, important effects of this phase include inhibition of the sympathetic nervous system, improved tissue oxygenation, dilation of peripheral blood vessels, muscle relaxation, and pain relief. After 10 to 30 minutes, the body’s capacity to dissipate the sauna’s heat diminishes. The body shunts blood to surface tissues with greater force. There are increases in body temperature, heart rate, circulation, and sweating. In fact, body temperature may rise 1–4 degrees Farenheit (F). This sauna-induced hyperthermia provides many beneficial effects. An important phase-two effect is hastening the death of weak cells, i.e., the destruction or disabling of relatively weaker cells and/or heat-sensitive cells. Examples of weakened cells that can be destroyed include cells 1) infected with viruses, 2) with damaged DNA, 3) holding radioactive minerals, 4) burdened with chemical toxins, 5) with high levels of toxic metals (e.g., mercury, lead, cadmium). In addition, other weak cells that can be destroyed during this phase include cancer cells, bacteria and spirochetes, as well as fungi and other parasites. As I mentioned previously, a unique benefit of far infrared saunas is deep tissue healing. Far infrared radiant energy penetrates skin and heats tissues to a depth of approximately 1.5 inches. This greatly facilitates sweating when compared to conventional hot air saunas that heat only the surface of the body. This deep penetration of heat allows sweating to occur at lower ambient temperatures. For many individuals, this is an advantage that makes far infrared saunas relatively more comfortable while offering equal or greater therapeutic effects. An in-depth reference edition that presents many findings from decades of garlic research: Garlic: The Science and Therapeutic Application of Allium sativum L. and Related Species. 2nd ed. Heinrich Koch, PhD, M. Pharm. ed. and Larry D. Lawson, PhD. Williams and Wilkins, 1996. Trans. of Knoblauch, 1988. Vaidya, Vipraja, Keith Ingold, and Derek Pratt. 2009. “Garlic: Source of the Ultimate Antioxidants – Sulfenic Acids.” Angewandte Chemie 2009, 121 (1): 163-166. “Health Benefits Of Garlic Traced to Acid Produced In Decomposing Organic Compound,” Medical News Today, Feb. 2nd, 2009. For additional information, see Sauna Therapy for Detoxification and Healing by Lawrence Wilson, MD. Wilson Consultants, 2006. The program emphasizes establishing basic nutrition via foundational nutritional supplement formulas, including high-RNA Rejuvenate!™ superfoods and other sources of dietary nucleic acids. The program rests on six elements: 1) Attitude/Commitment, 2) Detoxification, 3) Preventing Toxicity, 4) Health Building Nutrition, 5) Building Powerful Immunity, and 6) Supporting Protocols. In Part Four of the Rejuvenation Program series, I presented key roles played by four foundational nutritional supplements, which sometimes are referred to as “core” supplements. These supplements are critical to success in creating powerful health by establishing optimal nutrient status in the body. We at HPDI consider foundational supplements to include: 1) high-potency multivitamins, 2) essential fats, 3) Vitamin C / antioxidant formulas, and 4) Rejuvenate! high-RNA superfoods. These four types of foundational formulas are the most important nutritional supplements regardless of what other supplements you take. In particular, we recommend our HPDI supplement formulas, primarily because they incorporate the latest science, and provide the highest-purity and highest-quality nutrition, cutting-edge design, uniquely effective ingredients (e.g., coenzyme form B-vitamins). Perhaps most importantly, they have been designed to work together synergistically as part of our system of foundational nutrition. Multivitamin formulas include multivitamins Multi Two (tab and capsules) Hank & Brians’ Mighty Multi-Vite!, and our Mini Multi (contains no fillers, excipients, or additives). Our essential fats formulas include Omega Plus and Hank & Brian’s Essential Fats Plus E. Our Antioxidant and/or Vitamin C formulas include Ultimate Protector™, PRO-C™, OPC-C™, and Buffered C (tabs and powder). Recall that in Part Four of the Rejuvenation Program series, I also discussed foods recommended in our Rejuvenation Program. Our recommendations include consuming foods high in nucleic acids (RNA and DNA). RNA-rich foods include chlorella and Rejuvenate!™ superfoods. Rejuvenate! superfoods provide therapeutic levels of nucleic acids to support optimal rejuvenation, revitalization, and health. They also provide unique supporting nutrients (e.g., d-ribose, coenzyme B vitamins) that maximize utilization and healing effects of dietary nucleic acids. HPDI offers five versions of Rejuvenate!, including Rejuvenate! (original greens), Rejuvenate! PRO, Rejuvenate! PLUS, Rejuvenate! Berries & Herbs and Rejuvenate! Strawberry-Peach Protein Plus. Rejuvenate! PLUS and Rejuvenate Berries & Herbs are the most comprehensive in the line. Both provide delicious taste, therapeutic levels of dietary RNA, nutrients that support the body’s use of nucleic acids, a complete multivitamin, essential fats, and high levels of protein (except Berries & Herbs contains no greens). The four foundational supplements (multivitamins, essential fats, Vitamin C, and Rejuvenate! superfoods) are primary. They are needed to build health, especially because they provide significant nutrition and support detoxification. You can count on these supplements to provide a solid foundation for any nutritional supplement program. Now I’ll discuss the most important supplements that can be critical for building health beyond (i.e., in addition to) the four foundational supplements. That is, I’ll consider supplements in the “next tier” in terms of importance in our Rejuvenation Program. There are many “non-foundational” nutritional supplements (enhancements, add-ons, and/or specific-condition formulas) that can play important roles in building health. However, I will focus on seven supplements we find most useful in supporting the four foundational supplements (multivitamins, essential fats, Antioxidants / Vitamin C formulas, and Rejuvenate!™ high-RNA superfoods) to rejuvenate the body. These seven supplements have proven themselves in our Rejuvenation Program, and represent the next level of importance for supplements for rejuvenation. Coenzyme Q10 (CoQ10) is an important nutrient that is well known to boost cellular energy and acts as a powerful antioxidant. The primary function of this enzyme is to allow mitochondria to convert food metabolites (from the digestive process) into energy for cells. The body produces this enzyme, which is found in all cells, and which is especially abundant in heart, liver, and immune system. CoQ10 is a fat-soluble antioxidant that has many other functions and provides many benefits in the body. It protects and regenerates Vitamin E in cell membranes. CoQ10 also has been shown to stimulate the body’s immune system. When essential levels of CoQ10 are allowed to decline, the body’s vital organs and systems cannot meet their energy requirements. The inevitable results are major ill health and disease states. Advancing age causes the body gradually to lose its innate ability to produce CoQ10. Improper nutrition and/or maldigestion also can reduce the body’s ability to generate the needed amounts of CoQ10. Dosages in the range of 50-300 mg have been reported effective in cases of heart disease, fatigue, and immune deficiency. Numerous studies have indicated that supplemental CoQ10 in the amounts of 30-100 mg can be helpful when gums need to be strengthened. When individuals have low energy levels, CoQ10 boosts energy (ATP) production in cells and thereby provides greater levels of energy to the entire body. CoQ10 as ubiquinone is an oxidized form of ubiquinol. Ubiquinol is the reduced form of CoQ10 and is the form that is primarily used in the body. In younger (i.e., less than 40 years of age) and healthy individuals, the body readily makes ubiquinol from ubiquinone. Because ubiquinone costs about half as much as ubiquinol, it is more cost-effective for young or healthy individuals to take ubiquinone. Our CoQ10 Plus (100 mg) product contains 100 mg of ubiquinone along with the other fat-soluble vitamins E and A (as beta-carotene). This combination of antioxidants gets carried in the blood on lipoproteins and acts as a very powerful antioxidant. This combination also prevents crystallization of the CoQ10 in the softgel thereby keeping it bioavailable. For those over the age of 40 or with significant health issues, CoQ10 in the form of ubiquinol is much more effective, and in many cases necessary. In this case, we highly recommend our Ubiquinol 50 product that contains 50 mg of ubquinol. For enhanced absorption and stability (i.e., to prevent crystallization and oxidation), Ubiquinol-50 also contains d-limonene oil (emulsifier), caprylic acid, capric acid, and alpha-lipoic acid. CoQ10 (as ubiquinone) and/or Ubiquinol can play a major role in supporting rejuvenation by increasing cellular energy (ATP) production. Users often notice the difference immediately or shortly after starting to supplement with these potent, natural energy boosters. Magnesium is critical for rejuvenating the body. In fact, it’s so important, we’ve developed an entire magnesium protocol for topically applied magnesium chloride (oil, flakes, and gel) (and I will address the topic transdermal magnesium therapy in an upcoming article). However, today I will discuss the oral magnesium supplement we recommend most highly. While many of body’s needs for magnesium can be well met with topical magnesium chloride, certain applications (including our Rejuvenation Program itself) make excellent use of a specific oral magnesium supplement known as Myo-Mag. Myo-Mag is simultaneously an energizer (boosts celluar energy) and a relaxer (relaxes muscles) and rapidly boosts magnesium levels. Myo-Mag contains ingredients known to participate in ATP production in the body. One capsule contains 100 mg of magnesium and 440 mg of l-malic acid. Whereas magnesium plays a critical role in key enzymatic reactions for both aerobic and anaerobic glycolysis, L-malic acid is a Kreb cycle intermediate compound intricately involved in the production of energy (as ATP). Research indicates that when there is increased demand for ATP, there is also an increased demand and utilization of both magnesium and malic acid. Myo-Mag includes Vitamins B1 and B2 both in standard and phosphorylated coenzyme forms and Vitamin B6 in its phosphorylated coenzyme form only. These B vitamins are involved in many steps in energy production processes. Myo-Mag also provides manganese (because high levels of magnesium can deplete the body of manganese), magnesium carbonate (a malic acid buffer), and glycine as the carrier for a portion of the magnesium and for the manganese. Glycine is a carrier of magnesium in the blood and therefore can reduce the tendency to loosen stools for which other forms of magnesium are noted. We have found that Myo-Mag is a critical supplement for individuals experiencing fibromyalgia, multiple chemical sensitivity, chronic fatigue syndrome, diabetes, hypertension, and other conditions of low energy. In addition, we often recommended Myo-Mag for athletes just prior to intense exercise in order to keep them in an aerobic energy state for longer periods of time. Under hypoxic (i.e., low oxygen) conditions, Myo-Mag can support greater anaerobic energy production. Many of our customers have used Myo-Mag to reduce muscle cramping. One of six foundations in our Master Rejuvenation Program is detoxification. Indeed, rejuvenation of the body requires support for detoxification of the body, including liver detoxification. For this reason, we offer specific recommendations and supporting protocols for detoxification. Many supplements we recommended in our Rejuvenation Program support detoxification via increased energy production (e.g., see Nascent Iodine and Myo-Mag). Yet, we also know how vital direct support for the liver can be for health. We designed Hepa Plus with the specific purpose of supporting healthy liver function, including detoxification. Hepa Plus is a synergistic formula containing milk thistle (Silybum marianum) extract standardized to greater than 80 percent silymarin, dandelion root extract 4:1, alpha lipoic acid, n-acetyl l-cysteine (NAC), thiamin diphosphate (cocarboxylase), ornithine alpha-ketoglutarate, glycine, taurine, and minerals molybdenum and selenium. The liver plays a major role in metabolism and has a number of functions in the body, including detoxification, glycogen storage, decomposition of red blood cells, plasma protein synthesis, and hormone production. It produces bile, an alkaline compound which aids in digestion via the emulsification of lipids. Its highly specialized tissues also regulate a wide variety of high-volume biochemical reactions, including the synthesis and breakdown of small and complex molecules, many of which are necessary for normal vital functions. Simply put, the liver is necessary for survival. For example, there is currently no means to compensate for complete loss of liver function. Therefore, it is essential to maintain liver health both to sustain life and to create optimal health in a toxic world. Extensive research has shown that silymarin (the major component of milk thistle extract) exerts both a protective and a restorative effect on the liver and can stimulate the growth of new liver cells to replace old damaged cells. Studies have shown that dandelion root enhances the flow of bile, improving such conditions as liver congestion, bile duct inflammation, hepatitis, gallstones, and jaundice. Lipoic acid is an important nutrient that enhances metabolism, acts both as a water-soluble and fat-soluble antioxidant, and is a toxic metal chelator (including chelation of free iron, copper, cadmium, mercury, and lead). Thiamin diphosphate (cocarboxylase) is a coenzyme form of Vitamin B1 and is especially helpful for impaired liver function. Other nutrients in Hepa Plus include NAC, which is effective for increasing liver concentrations of glutathione, a critically important antioxidant in the liver claimed to be responsible for about 60% of the liver’s detoxification processes. Glycine and taurine play important roles in Phase II liver detoxification pathways. Ornithine plays a key role in the urea cycle and allows the liver to eliminate the buildup of toxic levels of ammonia. Molybdenum and selenium are essential minerals for the synthesis of enzymes that support liver detoxification. HPDI designed Hepa Plus as your powerful ally for building and maintaining liver health because optimal liver function is critical to detoxification and successful rejuvenation. When liver function is restored and/or improved and thereby brought into a state of health, your body’s overall capacity to heal and rejuvenate becomes much greater. Because nutrients that help maintain peak liver function play important roles in our Rejuvenation Program, Hepa Plus is the supplement we recommend most highly for direct liver support, as it provides nutrients critically needed for it. Nascent Iodine is a unique, ideal form of iodine that is rapidly absorbed and used by the body when taken as a nutritional supplement. It is associated with a wide range of benefits, not limited to supporting thyroid function and regulating metabolism, boosting energy levels (when iodine is deficient), supporting and maintaining detoxification systems and processes, supporting immune system function, fighting infections (natural antiseptic), and many other healthy benefits. Because of its antiseptic properties, it also can be used effectively to purify water for drinking. One drop provides 400 micrograms of Nascent Iodine in a base of organic grain alcohol. More than 90% of Americans suffer from a deficiency of iodine. There are many causes for widespread deficiency among the population. Significant factors include diets lacking in ocean fish or sea vegetables (e.g., seaweeds), high intakes of toxic bromine (which is added to commercial breads and baked goods), and vegetarian or vegan diets (see more below), all of which can contribute to less than optimal levels of iodine. Moreover, it is known that toxic halides, including chlorine, fluorine (e.g., fluoride in toothpaste), and bromine (e.g., in breads) compete for uptake with iodine in the body, and thereby contribute to iodine deficiency. Iodine deficiency can lead to the development of many adverse health conditions (and a wide variety of symptoms) because the entire body (i.e., all organ systems) depends upon iodine for the critical roles it plays energy production, healthy metabolism, and overall support of health. Nascent Iodine helps you transition from state of iodine deficiency to achieving optimal iodine levels. Nascent Iodine biochemically is consumable iodine in an atomic form rather than a molecular form. It is a highly bioavailable, pure atomic iodine supplement in an energized state. This “charged” state is held by the atom until diluted in water and consumed, whereupon it gradually loses energy over a two to three hour span. During this time, the body recognizes Nascent Iodine as identical to the iodine used by the thyroid, and therefore it is absorbed effortlessly. This form of iodine is unique and well known to offer beneficial effects unlike any other form of iodine. In fact, Nascent Iodine is the most easily assimilated iodine available. A healthy immune system is required for rejuvenation. Yet, often it is the immune system itself that requires rejuvenating to bring it to a level where it can better support rejuvenation of the entire body. Our Rejuvenation Program therefore builds the immune system and includes supplement recommendations and supporting protocols to accomplish that goal. Two of the most important immune building supplements we recommend are Echinacea (an immune enhancing herb) and Immune-Assist (a six-mushroom complex that provides polysaccharides that provide a wide range of health benefits). Echinacea is one of the most powerful herbs known for boosting the immune system. Research shows that echinacea boosts immunity, prevents infection, and helps reduce the duration of illness. It also helps promote healing, has antiseptic and anti-inflammatory qualities, and stimulates the nervous system. It is an amazingly versatile herb. Echinacea can be taken internally and applied externally to fight bacterial infections. It can also be used internally to lower fever and reduce allergic reactions. It is effective in fighting infectious conditions, including influenza, common colds, candida, herpes, and respiratory infections. In combination with other herbs it may be used for infections in any area of the body. For example, in combination with yarrow or bearberry it will effectively stop cystitis (bladder infection). You can make your own echinacea tincture in a glass mason jar using fresh organic or wildcrafted echinacea roots, leaves, and seeds (available from Pacific Botanicals, 541-479-7777) soaked in vodka. Soak the herbs for several weeks in enough vodka to see 1/3 liquid above the solids at the top of the jar). Shake once or twice daily. After three to four weeks, strain through cheesecloth or a cotton towel into a large bowl, and then pour the filtered Echinacea tincture into the glass mason jar and/or dropper bottles. Use two droppers full (about 70 drops) of tincture four times daily. Rejuvenation requires strong a strong immune system. While echinacea can provide a significant boost to immunity, there are other immune-building supplements that exert powerful effects. One of the best (and one we highly recommend) is Immune-Assist™, a unique mushroom-derived polysaccharide complex in a vegetarian capsule. Immune-Assist™ Daily Formula is a new type of dietary supplement. It contains more than 200 different polysaccharides, derived from enzymatic breakdown of organic material derived from six different species of medicinal mushrooms. These include the species Agaricus blazei, Cordyceps sinensis hybrid, Lentinula edodes (shiitake), Grifola frondosa (maitake), Ganoderma lucidum (reishi), and Coriolus versicolor. Immune Assist™ contains 500 mg per vegetarian capsule and is made in America using only USDA-certified organic materials. Scientific research shows that medicinal mushrooms grown on vegetable sources (including millet, rice bran, buckwheat, barley, etc.) activate an enzymatic process whereby complex cross-linked polysaccharides from these vegetable sources convert to biologically active immunomodulators (a.k.a., “biological response modifiers”). The polysaccharides produced from this process are powerful immune system stimulators that are effective and safe. For this reason, Immune Assist™ and other mushroom supplements are growing in popularity among health-minded indivduals. Immune-Assist™ consistently and effectively boosts immune system function in the following ways: 1) stimulates cytokine (IL-2, IL-12, Tumor Necrosis Factor (TNF), and Interferon) production, which stimulates immune function, 2) increases Natural Killer (NK) cell activity against diseased cells, 3) increases the formation of explosive granules within NK cells, 4) increases the number and the activity of lymphocytes, specifically increasing T cells, 5) increases Interferon levels, which inhibits the replication of viruses and stimulates NK cell activity, and 6) increases the formation of TNF, a group of proteins that help destroy cancer cells. Applications for Immune Assist™ include: 1) recurrent infections, such as colds, flu, and parasites, 2) gum disease, 3) heart disease, 4) peptic ulcer, 5) cancers, 6) slow healing wounds, 7) digestive problems, 8) AIDS, 9) hepatitis, 10) multiple sclerosis, and 11) autoimmune illnesses. Immune Assist™ has not exhibited side effects and is completely non-toxic even after years of use at therapeutic levels. The importance of a strong, adaptable immune system cannot be underestimated, especially in the context of building (or rebuilding) health and for successful rejuvenation. While there are other useful immune building supplements (e.g., garlic, olive leaf extract), both echinacea and Immune Assist™ have proven highly effective for boosting immunity as part of a complete program for rejuvenation. It is vital to take the four foundational nutritional supplements, which include a high-quality multivitamin formula, essential fats, an Antioxidant/Vitamin C formula, and a high-RNA superfood (e.g., Rejuvenate!™ superfoods) as part of a complete program of rejuvenation because the nutrients they provide remain foundational to health. 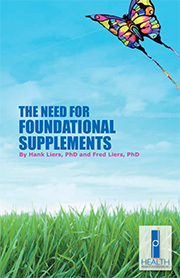 Yet, optimal results usually depend on additional supplements both building on the nutrition provided by the foundational nutritional supplements and providing unique benefits beyond foundational nutrition. I have described seven of the most important additional supplements you can take for this purpose: CoQ10 + (100 mg) (as ubiquinone) or Ubiquinol-50, Myo-Mag, Hepa Plus, Nascent Iodine, Echinacea, and Immune Assist. When you combine solid basic nutrition and foundational nutritional supplements with a combination of additional supplements right for you, you can expect results far exceeding what is possible for health when taking either foundational nutritional supplements, or additional supplements by themselves. The synergistic effects of this combination can transcend the effects of the individual supplements. Therefore, significant synergy results from combining the four foundational supplements with other supplements that optimize biological function, boost cellular energy (as ATP), enhance immunity, support detoxification processes, and help create powerful health from the inside-out. It is evident that supplements by themselves are no replacement for the right attitude, healthy diet, detoxification, proper exercise, meditation, and other elements in our Rejuvenation Program. However, when the proper supplements are combined with other elements in the program, the supplements play a critical role in creating health and supporting your regeneration and rejuvenation. Following the best practices generally produces the best results. This is especially true when establishing superior nutrition that can powerfully support rejuvenation and create sustainable health. This is why we at HPDI suggest first establishing a foundation for good health using foundational nutritional supplements, and then recommend adding specific additional supplements that build on your nutrient foundation in order to facilitate and optimize processes of regeneration and rejuvenation. The program emphasizes establishing basic nutrition, foundational nutritional formulas, and high-RNA Rejuvenate!™ superfoods and other sources of dietary nucleic acids. The program rests on six elements: 1) Attitude/Commitment, 2) Detoxification, 3) Preventing Toxicity, 4) Health Building Nutrition, 5) Building Powerful Immunity, and 6) Supporting Protocols. As I stated in Part Three of the Rejuvenation Program series, health building nutrition plays a major role in the process of rejuvenation. We recommend emphasizing organic and/or wildcrafted foods, consuming more plant-based foods, raw foods, and generally consuming natural, whole foods (e.g., avoiding refined/processed foods). I also discussed foods recommended in our Rejuvenation Program. Our recommendations include consuming foods high in nucleic acids (RNA and DNA). RNA-rich foods include chlorella and Rejuvenate!™ superfoods. Rejuvenate! superfoods provide therapeutic levels of nucleic acids to support optimal rejuvenation, revitalization, and health. They also provide supporting nutrients (e.g., d-ribose, coenzyme B vitamins) that maximize utilization and healing effects of dietary nucleic acids in the body. HPDI offers three versions of Rejuvenate!, including Rejuvenate! (original greens), Rejuvenate PLUS, and Rejuvenate! Berries & Herbs. Rejuvenate! PLUS and Rejuvenate Berries & Herbs are the most complete. Both provide delicious taste, therapeutic levels of dietary RNA, nutrients that support the body’s use of nucleic acids (e.g., d-ribose), a complete multivitamin, essential fats, and high levels of protein. Last month, I discussed dietary/food aspects of nutrition. Today, I present key roles played by what we call “foundational” (or sometimes “core”) nutritional supplements. Foundational nutritional supplements are one of the critical means to success in creating powerful health by establishing optimal nutrient status in the body. Foundational supplements include: 1) multivitamins, 2) An antioxidant / Vitamin C formula, 3) essential fats, and 4) high-RNA superfoods. We have found that proper nutritional supplementation provides important nutrients not always easily available in the diet. This partly relates to the fact that our needs for nutrients have never been greater. In addition, there are various reasons that most foods are deficient in nutrients, and therefore cannot or do not provide levels of nutrients required to sustain optimal health. Some reasons dietary supplements are necessary include the fact that most crops are grown in nutrient-deficient or depleted soils; increased demands by the body due to greater needs for nutrients (relating to detoxification, stress, pollution, etc. ); biochemical individuality resulting in greater needs for certain nutrients depending on the biochemistry unique to individuals. Biochemical individuality means that a person may require many times the US Daily Value of specific nutrients. In fact, one person may need hundreds of times the amount of a nutrient compared to a different person. In addition, needs change during the year due to environmental circumstances. Changing seasons, environments, air/water supply, etc. mean that an individual’s need for nutrients typically changes during the year (e.g., more vitamin D needed in the winter, more nutrients needed to deal with pollution associated with urban environments or stress, etc.). Nutrient density of foods also varies by location, season, etc. The availability of nutrients in foods (even organically grown foods) can vary substantially due to season, geography, growing methods, etc. All these factors add up to the fact that it is difficult to ensure optimal nutrient status without supplementation. Because the need for nutrients is greater than ever for most people, the need for nutritional supplementation is also greater than ever. Nutritional supplements provide an effective (and cost effective) means to ensure the high levels of nutrients required to build, sustain, and maintain optimal health. As noted above, the four foundational nutritional supplements we recommend are: 1) a high-potency multivitamin, 2) an essential fats formula (omega-3 and omega-6), and 3) Vitamin C (preferably buffered) with antioxidants (especially bioflavonoids), and 4) Rejuvenate!™ superfoods (and/or other high-RNA superfoods). These four types of foundational formulas are the most important supplements and superfoods. Even if you take no other dietary supplements, these are the formulas that ensure you get basic nutrients required for good health. In fact, no diet or nutritional supplementation program is complete without them. I will now consider the four types of foundational formulas, explain how they function, and reasons why they essential for good health. A high-quality, high-potency multivitamin is the single most important supplement you can take. A good multivitamin ensures you receive important nutrients not always available in optimal amounts in foods. Taking a multivitamin helps guarantee uptake of nutrients that ar e not readily available because modern diets have strayed far from traditional diets. In addition, modern lifestyles create far greater demands for critical nutrients even as many nutrients are increasingly less available from foods. Multivitamins help break the cycle of deficiency and degeneration. Critical nutrients provided by a good therapeutic multivitamin formula include a wide range of essential vitamins, minerals, and cofactors. Such a formula will usually include trace minerals, fat-soluble vitamins (A, E, D, & K), coenzyme B vitamins, magnesium, or other nutrients known to be deficient in the diets of most individuals. Important factors to consider when looking for a good multivitamin, include high-potency, forms, completeness, balance, assimilability (e.g., ease of uptake and rapid assimilation), ease of use (convenience), etc. High-potency is important because for most nutrients, the so-called “daily value” is simply inadequate for most people. Most individuals need many times the daily value of vitamins for good health. This is because daily values are established based on minimum amounts required for sustain life (e.g., survival) rather than the optimal amounts needed for good health. As noted, studies of biochemical individuality show that individuals may require many times greater amounts of specific nutrients than are needed by the average person. Because most vitamins (especially water soluble ones) are essentially non-toxic even in relatively large doses (i.e., hundreds or sometimes thousands of times the daily value), it pays to provide your body with larger amounts of critical nutrients that it may require because you may not be an ‘average’ person. Complicating this picture is the fact that individuals needs for specific nutrients vary widely. Thus, for example, one person’s need for vitamin C may be somewhat higher than average, yet the same person’s need for vitamin D may be significantly higher than average. The proper forms of the nutrients are another critical factor. While forms have not always been a prime consideration (either of consumers or formulators), they are critically important. Forms are worthy of attention because we know that the form of a vitamin or mineral can make a major difference in terms of how it assimilated and used in the body. For example, Krebs cycle bionutrients (i.e., mineral carriers, such as citrates, malates, alpha-ketoglutarates, succinates, or fumarates) are known to be superior precisely because they are the forms naturally recognized and utilized in the body. This is because these forms are used in the Krebs cycle (or citric acid cycle) that is part of the metabolic pathway used to generate energy (ATP) from nutrients in foods. In contrast, elemental forms of minerals and/or forms that are not part of the Krebs cycle may be more difficult to assimilate because they must be converted into forms the body can use. The biological cost is reduced bioavailability, as well as cellular energy expense and time required for metabolic conversion. As you can see, forms matter for health! Other important factors include completeness and balance. Completeness is important in a multivitamin because the body requires a wide range of nutrients working together to create and sustain health. Many multivitamins are neither complete nor balanced. This relates partly to the fact that multivitamins are often not designed with an understanding of nutrients, forms, or amounts needed for health. Consequently, many commonly available multivitamins incorporate less effective forms, inadequate amounts, and improper ratios of nutrients. This reflects a general lack of understanding by formulators about how nutrients work together to build and sustain health. In contrast, supplements are available that provide completeness and balance. HPDI offers several high-quality, balanced, and complete multivitamins providing easily assimilated forms of nutrients in optimal amounts. These include Hank & Brian’s Mighty Multi-Vite!, Multi Two caps or tabs, Mini Multi, and Chewable Kids Mighty-Multi! (which is also designed for adults to enjoy, too). We recommend our capsule formulas because they are the easier to assimilate. However, our tablet formulas are both effective and cost-effective. The Mini Multi capsule contains no additives and is designed especially for chemically and environmentally sensitive individuals. In addition, children benefit greatly from a multivitamin, and for them we offer our chewable Kids Mighty-Multi! multivitamin formula. Vitamin C is legendary for its healing capacities. Yet, it is notable that despite numerous studies and accolades by nutritionists, it remains underutilized by mainstream medicine and is completely under-appreciated for the healing powerhouse it represents for human health. We include Vitamin C as a foundational formula because we understand its role in creating and sustaining optimal health. Vitamin C not only is a potent antioxidant, but also a powerful immune builder/anti-viral, cholesterol controller, and connective tissue strengthener. In fact, no other vitamin or nutrient can take its place in terms of what it can contribute to human health, longevity, and well-being. Ever since Linus Pauling wrote Vitamin C and the Common Cold, Vitamin C has held a place of esteem among nutritional scientists and consumers of Vitamin C products. Pauling went on to present further studies and to write his best-seller How to Live Longer and Feel Better (rev. 2006). Vitamin C plays a major role both in his discussion of vitamins and in the supplement regimens he recommends. In nature, Vitamin C is always combined with bioflavanoids. Bioflavanoids (such as rutin, quercetin, catechins, anthocyandins, and oligomeric proanthocyanidins (OPCs)), work synergistically with Vitamin C to create powerful antioxidant effects, counteract inflammation, and strengthen connective tissues. In addition, Vitamin C and bioflavanoids combine with other antioxidants (including glutathione, lipoic acid, and selenium) in a process called “redox cycling.” In this process, antioxidants protect and “spare” each other, thereby allowing for significantly increased antioxidant protection in the body. We offer a variety of Vitamin C products, including formulas with bioflavonoids. Our Vitamin C formulas include Ultimate Protector™, PRO-C™, OPC-C, Buffered Vitamin C tabs, Buffered Vitamin C powder, and Synergy C. We typically recommend taking a buffered Vitamin C product to prevent acidosis (as can happen with non-buffered ascorbic acid) and help maintain proper pH levels in the body. We consistently find that one of greatest means for success in creating health using dietary supplements is to ensure you take all four types of foundational formulas. For example, many people take one or two foundational formulas: a multivitamin, essential fats, Vitamin C plus bioflavonoids, and/or high-RNA superfoods. But how many people take all four daily? Do you take all four daily? You might be surprised at the results if you took them all daily. This is because foundational formulas work together synergistically and leverage each other in ways that exceed the health-building effects that can be expected when foundational formulas are taken individually. Many people understand the need to take supplemental multivitamins. The need for essential fatty acids (EFAs) has gained increased attention recently, and it is no less important. More people are consuming fish, fish oils, and vegetarian sources of essential fats, including chia seeds. However, the need for supplementing diet with essential fats to ensure adequate daily intake has never been greater than today. There are two basic essential fats: alpha-linoleic acid (omega-3) and linolenic acid (omega-6). Other fats are sometimes included as being essential fats, including gamma-linolenic acid (GLA), an important omega-6 fatty acid, and eicosapentanoic acid (EPA) and docosahexanoic acid (DHA), important omega-3 fatty acids. Essential fats are considered ‘essential’ because they are needed for biological processes (i.e., they are required to sustain life) rather than acting only as a food-based source of energy (as do many other non-essential fatty acids). Humans, therefore, must ingest essential fatty acids both for survival and for good health. Essential fats play multiple roles in the body and serve many different functions. These functions include being modified to make eicosanoids (affecting pain and inflammatory processes); regulating steroid production and hormone synthesis; regulating pressure in the eyes, joints and blood vessels; mediating the immune response; regulating smooth muscle and autonomic reflexes; are needed for oxygen transport from red blood cells to tissues; are necessary for kidney function and fluid balance; preventing clumping of red blood cells; regulating mood and depression, and regulating nerve transmission. Every cell and organelle within the cells are encased and protected by membrane made of phospholipids. A major component of these phospholipids are essential fatty acids that control membrane fluidity and the ability to pass important nutrients into the cells and toxins out of the cells. Without adequate essential fats the cell membranes can become rigid and dysfunctional. We offer several essential fats products, including Hank & Brian’s Essential Fats Plus E and Omega Plus. Both of these products contain EPA and DHA from highly purified fish oils, GLA from cold-processed borage oil, and full spectrum Vitamin E consisting of all eight natural forms of tocotrienols and tocopherols. These mixed forms of Vitamin E perform many beneficial functions in the body (such as lowering cholesterol and clearing plague out of blood vessels) and also protect the essential fats from oxidizing in the capsule and in your body. The ratio of EPA to GLA in these products is 4:1, which is considered the ideal ratio for optimal effects in the body. Our recommendations for foundational formulas now include high-RNA superfoods. We first recommend a multivitamin, an antioxidant / Vitamin C formula, and essential fatty acids. After these three foundational formulas are established in a daily regimen, the addition of a high-RNA superfood further contributes to excellent health. We include high-RNA superfoods (and especially recommend Rejuvenate!™ superfoods) in our foundational supplements program after having studied the remarkable healing powers of chlorella and other high-RNA nutrients for six years. When taken in sufficient amounts, superfoods high in ribonucleic acid (RNA) show remarkable effects in the body. These effects include higher energy levels, greater endurance, better muscle strength, easier breathing, lower cholesterol levels, reductions in angina pains (and other positive cardiovascular effects), more stable blood sugar, better vision, and a more youthful appearance (smoother skin, fewer wrinkles, etc. ), and many other benefits. Our assessment of dietary nucleic acids being essential nutrients is shared by scientists on the cutting-edge of nutrition. In Nucleic Acid Nutrition and Therapy, Dr. Benjamin S. Frank asserts that dietary nucleic acids (RNA, DNA) are “essential nutrients of human beings” as distinct from non-essential, accessory nutrients. He considers nucleic acids and nucleotides an essential dietary category, i.e., as being nutrients “just as essential for humans as vitamins, minerals, proteins, carbohydrates, and lipids” (Frank). Dr. Frank’s conclusion that RNA is more essential to health than any other single nutrient underscores the central role of nucleic acids for human health. We share Dr. Frank’s conclusions regarding the “essential” nature of nucleic acids and nucleotides, and their central role in human health. In fact, it is our direct experience with the health-building effects of dietary nucleic acids (e.g., in chlorella and other foods) that led to further our knowledge of nucleic acid nutrition and therapy, and develop our line of high-RNA Rejuvenate!™ superfoods. Rejuvenate!™ superfoods both provide optimal levels of nucleic acids and include supporting nutrients (e.g., d-ribose, coenzyme B vitamins), which maximize the beneficial effects of dietary RNA for health. The nucleic acids in Rejuvenate!™ superfoods work directly with HPDI’s other foundational nutritional supplements to create, sustain, and support optimal nutrition for health and healing. We recommend Rejuvenate!™ and/or other high-RNA superfoods as part of program of foundational nutritional supplements that work together to provide full spectrum nutrition. It is because foundational formulas provides a full spectrum of essential nutrients that it is critical to success in our Rejuvenation Program, and to create, maintain, and/or rebuild health. The best news with respect to dietary nucleic acids is that while they are essential nutrients, their inclusion in our foundational supplement program powerfully leverages their effects by facilitating greater synergy among all nutrients available to the body via foundational supplements. This synergy means the total package of nutrients delivered by all four types of foundational supplements combined delivers far more health-building nutrition than any single foundational formula delivers individually. That’s synergy in action. The means by which all four foundational supplements succeed in creating and contributing to powerful health relates less to the fact that each singly provides an ‘essential’ piece of the nutrition puzzle. Success relates instead to the fact that when all foundational formulas are taken together, their healthy benefits multiply and greatly exceed the sum of benefits provided by individual foundational formulas. This is a primary reason we emphasize establishing foundational nutrition both within our Rejuvenation Program, and more generally as a starting point for the creation of powerful health.